EasyDose is now functional with an electronic signature pad. 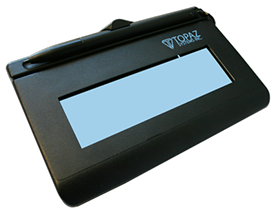 SigLite® 1×5 is Topaz’s low-cost, pressure-sensitive electronic signature pad. It features all the high quality biometric and forensic capture techniques of a SignatureGem tablet but with a low-cost touchpad and stylus in place of the active electromagnetic pen and sensor. 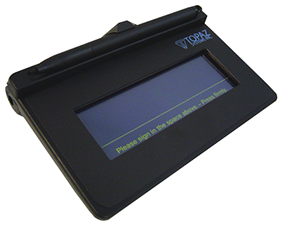 SigLite® LCD 1×5 is Topaz’s low-cost, pressure-sensitive electronic signature capture pad. It features all the high-quality biometric and forensic capture techniques of a SignatureGem® LCD tablet but with a low-cost touchpad and stylus in place of the more rugged digitizing pen and inert tempered glass surface of the SignatureGem tablet series. These signature pads will negate handwritten documents and signatures in the states where Patients are required to sign for their dose. An original signature is held for a patient in their Patient Details Form. Whenever a patient is dosed, the pharmacists will be prompted to have the patient sign on the signature pad. The pharmacist will be able to view both the Original signature and the New signature on the computer screen. If the pharmacist believes or knows the signatures to match, then he approves the signature and then perform their verification. The signature can be rejected and the patient advised to resign if the signatures do not match. EasyDose do not sell or on-sell these products. SYM-PAC Warehouse are one of the distributors of these products inside of Australia. Both models are part of their general range.